Let's Go Blue! Sporting a real yarn pom pom and a glittered "CHEER", the blue pom cheerleader personalized Christmas ornament arrives with a display cord in place and tucked in our velvet drawstring pouch. 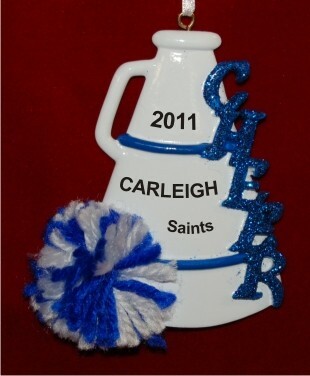 These cheerleading ornaments personalized for each recipient make great gifts for your favorite rah-rah guy or gal. Some coaches have one made for each team member to build unity or celebrate a great season. We use a font more stylish than the one shown for clarity to add your custom details to these sports ornaments from Russell Rhodes. Support the effort and hard work with the blue pom cheerleader Christmas ornament personalized as a great memory now and always.